Section 33 is one of the more talked-about provisions of the Finance Act, 2018. This is the section that reintroduces a tax on long-term capital gains (“LTCG”), where the LTCG arises from the transfer of “an equity share in a company or a unit of an equity-oriented fund or a unit of a business unit” (Ministry of Law and Justice, 2018). Under the new law, a tax of ten percent will be liable on all LTCG exceeding INR one lakh, where the LTCG arises from the sale of assets described above held for over a year (Income Tax Department, 2018). The LTCG tax has come in for scrutiny and criticism in the financial press. Some commentators have predicted negative consequences for small investors (Arora, 2018; Sampath & Thomas, 2018). Others have noted that the tax will lead to double taxation because some securities transactions will bear both the LTCG tax and the already existing securities transaction tax (Sampath & Thomas, 2018; Business Today, 2018). Yet others have pointed out that there is a lack of clarity about the application of the LTCG tax to specific transaction types, including share inheritances, mergers, and initial public offerings (Upadhyay, 2018). The central government has defended the tax by pointing out that it reduces distortions in investment incentives by reducing discrepancies in tax rates across asset classes (The Hindu, 2018; The Telegraph, 2018). The opinions have been manifold and heterogenous but have been, in the end, no matter how well reasoned, only opinions. There has been a shortage of quantitative economic analysis of the LTCG and its effect on the Indian economy. In this article, we address this gap by presenting our estimates of the impact of the LTCG on the cost of investment in the main sectors of the Indian economy and at the all-India level. Intuitively, one would expect the LTCG tax to increase the cost of investment since it increases the hurdle rate – the minimum return that an investment project must earn for financial viability – of a project. Consider a simple example where an investment project is financed only by equity and dividends are not distributed. Suppose the investors expect a 7.0 percent post-tax return from the project. Before the LTCG tax, the project would be feasible if it had a pre-tax return of 7.0 percent. Under the LTCG tax, the project feasibility would require a pre-tax return of at least 7.7 percent: 7.0 percent for the investor as capital gains and 0.7 percent for the government as the LTCG tax. The LTCG tax has thus increased the project’s hurdle rate from 7.0 percent to 7.7 percent. 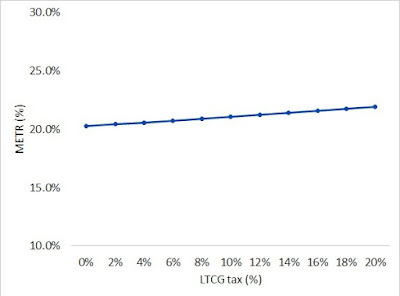 In the example above, the cost of investment increased by the full extent of the LTCG tax. This is not true for a real-world investment whose tax cost is a function of all the taxes associated with the investment, macroeconomic conditions, and the structure of the investment itself. Apart from the LTCG tax, other taxes affecting the investment cost are the corporate income tax and indirect taxes. There are also tax incentives, which may be asset- and sector-specific, that reduce the tax cost of investment. The investment will have a particular distribution of assets – some investments require more transportation assets, others more machinery assets – and this structure too affects the tax cost of investment. This is because each asset has a different tax treatment: if highly taxed assets are a major cost of investment, then the tax cost will be high and vice versa. And macroeconomic conditions like inflation affect the value of benefits like depreciation allowances, and therefore affect the tax cost of investment. Given the complex relationships that define the tax cost of investment, it is not feasible to predict with certainty what the relationship between the LTCG tax and the cost of investment might be. But two hypotheses might be formulated on the basis of the discussion above. First, the LTCG tax will increase the tax cost of investment; after all, it does increase the cost of project finance. Second, the impact of the LTCG tax will be minor; considering the wide array of factors affecting the tax cost. Measuring the tax cost of investment requires an adequate modelling framework. The framework should at least have the three following characteristics. First, it should be flexible enough to model the impacts of all taxes and tax incentives on the cost of investment. Second, the model should be well targeted, i.e. it should measure the tax impact on investment, but not non-investment activities. Finally, the model should allow aggregation, such that firm-level data can be used to estimate tax costs at the sectoral or national levels. One model that meets these criteria is used to measure Marginal Effective Tax Rates (“METRs”). This model uses firm-level and macroeconomic data to estimate the tax wedge on investment, the difference between the pre-tax and post-tax rates of return earned by a marginal investment project. By construction, the METR model only focuses on marginal investment to the exclusion of other aspects of a firm’s business. The METR itself is a function of all taxes and tax incentives levied. These include direct taxes on businesses and investors, indirect taxes on capital purchases, and incentives like accelerated depreciation and tax credits. And the model allows for aggregation from firm-level METRs right up to one national level number. We have estimated the tax cost of investment using the METR model, which we have developed for India and discussed earlier on this website (see Ghosh & Mintz (2017)). Specifically, we have estimated the tax cost of investment before and after the implementation of the LTCG tax. A comparison of the before and after values provides an estimate of the impact of the LTCG tax on the tax cost of investment. METRs in the main sectors of the Indian economy and at the overall all-India level are shown in Figure 1. These sectors together comprised 96.5 percent of all investment in the Indian economy in FY2015-16 (Prowess, 2018). Each sector in Figure 1 has three data points. The left-hand column is the METR before the LTCG tax was reinstated, i.e. LTCG tax rate = 0.0 percent. The right-hand column is the METR after the LTCG tax was reinstated, i.e. LTCG tax rate = 10.0 percent. The line shows the change in the METR after the imposition of the LTCG tax. The results indicate that the LTCG tax has increased the tax cost of investment – as measured by METRs – in all sectors of the Indian economy. The only exception is the agriculture sector, which is the beneficiary of multitudinous direct and indirect tax exceptions. These combine to ensure that the LTCG tax has no effect on the agriculture METR. Overall, at the all-India level, the METR has increased from a pre-LTCG-tax value of 20.3 percent to a post-LTCG-tax value 21.1 percent: implementing an LTCG tax of 10.0 percent has yielded a 3.9 percent increase in the METR. This is equivalent to an elasticity of 0.03 in the neighbourhood of the LTCG tax rate. One may infer that the METR is barely sensitive to the LTCG tax rate. 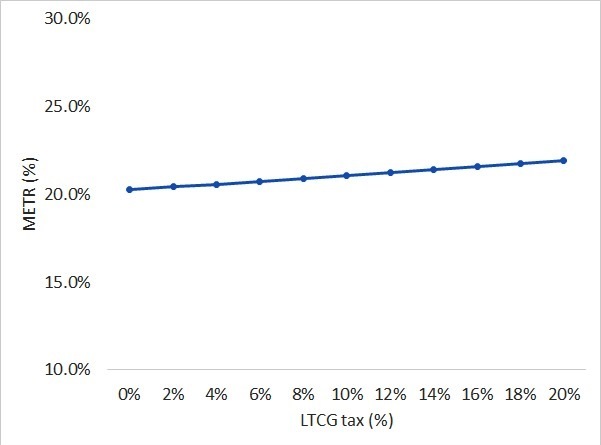 The minimal response of the METR to the LTCG tax is confirmed by the result in Figure 2, where a METRs are plotted for a sequence of the LTCG tax rates. Increasing the LTCG rate from zero to 20.0 percent only increases the METR from 20.3 percent to 21.9 percent, an increase of 8.1 percent. 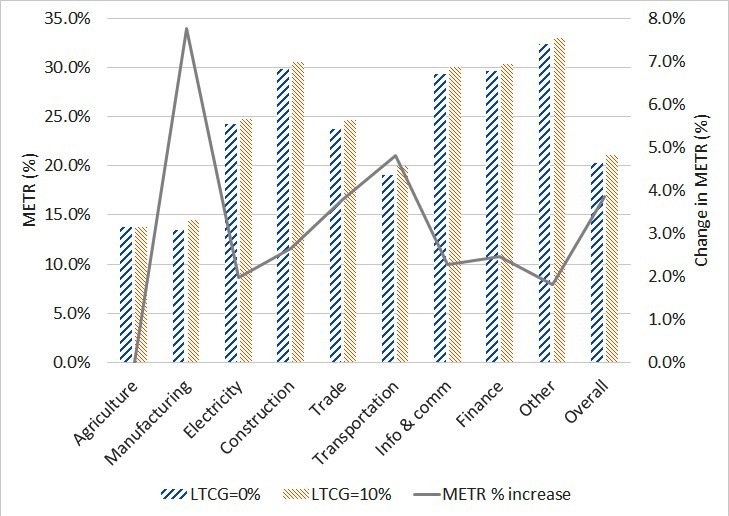 The relationship between the LTCG tax and the METR is roughly linear (the relationship is slightly convex, but this is not very evident in Figure 2). Coming back to Figure 1, we see heterogeneity in the METR change at the sectoral level where – not counting agriculture – the change in METRs range from 1.8 percent in the “other” sector to 7.8 percent in manufacturing. The largest [smallest] METR changes are in the sectors with the lowest [highest] METRs. In other words, the LTCG tax has the greatest [smallest] impact on METRs in sectors where investment is least [most] burdened by taxes. The sectors most affected by the LTCG are manufacturing and transportation, which have the lowest METRs. Manufacturing has a low METR because of generous tax depreciation allowances on machinery. The low METRs for the transportation sector depend on firms charging GST under the forward charge mechanism. If the reverse charge mechanism were used, then the METR is much higher because of significant blocked input tax credits. The least affected sectors – “other” and finance” – are also those with the highest METRs. These sectors suffer high METRs because of adverse asset compositions. Overall, it seems that the LTCG tax reduces tax load discrepancies across sectors by a small amount, and thereby contributes marginally to a levelling of the playing field for investment. In summary, the following can be said about the impact of the LTCG tax on investment incentives in the country. First, the overall relationship between the LTCG tax and the tax cost of investment (as measured by the METR) is positive, but weak. Since the LTCG tax does not change the METR in any significant way, one may infer that it will not affect investment decisions to any significant degree. Second, there is some heterogeneity at the sector level, with sectors with hitherto low METRs worse affected by the LTCG tax change than sectors with high METRs. The LTCG tax therefore makes a (very) small contribution in levelling the playing field for investment. This second result provides weak support for the government’s contention that the LTCG tax will reduce investment distortions (The Telegraph, 2018), although the mechanism differs from that suggested in the referenced article. Arora, I. (2018, Mar 14). Government receives requests to drop planned long-term capital gains tax. Business Today. (2018, Feb 05). How LTCG tax affects mutual fund investors. Ghosh, G., & Mintz, J. (2017, Nov 23). Measuring the pre and post GST tax cost of investment. Income Tax Department. (2018). Tax on Long-Term Capital Gains, Income Tax Department, Ministry of Finance, New Delhi. Ministry of Law and Justice. (2018). The Finance Act, 2018 (No. 13 of 2018), Ministry of Law and Justice (Legislative Department), New Delhi. Prowess. (2018). [cross tabulation of data]. Sampath, A., & Thomas, S. (2018, Feb 09). Long-term capital gains tax on equity: Will it scare away small investors?. The Hindu. (2018, Feb 06). For more equity: on long-term capital gains tax. The Telegraph. (2018, Feb 06). LTCG exemption for equities was a risk for small investors, govt says. Upadhyay, P. (2018, Feb 19). Union budget 2018: Long-term capital gains tax - the unanswered questions. The Centre's approach to Insolvency and Bankruptcy Code has costs by Bhargavi Zaveri in Mint, June 14, 2018. Going on a hike by Ila Patnaik in The Indian Express, June 13, 2018. The need for a term money market by Harsh Vardhan in Mint, June 11, 2018. A wake-up call for promoters by Suharsh Sinha in Business Standard, June 10, 2018. Carte blanche to notify law requires reform by Somasekhar Sundaresan on Wordpress, June 9, 2018. As good as a random walk: Inflation forecasting in emerging market economies by Roberto Duncan and Enrique Martínez García in Vox, June 8, 2018. The best way to save the planet? Drop meat and dairy by George Monbiot in The Guardian, June 8, 2018. The Millionaires Are Fleeing. Maybe You Should, Too by Ruchir Sharma in The New York Times, June 2, 2018. Try bankruptcy for Air India's sale in The Economic Times, June 1, 2018. Also see. Data in a post-truth age by Sonalde Desai in The Hindu, May 30, 2018. This Isn't Just About Paytm – Laws on Government Access to Data Need to Change by Madhulika Srikumar in The Wire, May 28, 2018. How nations come together by Andreas Wimmer in Aeon, May 24, 2018. Chatbots were the next big thing: what happened? by Justin Lee in Growthbot, May 6, 2018. Love Story by David Brooks in The New York Times, May 1, 2018. Social Ties in Academia: A Friend Is a Treasure by Tommaso Colussi in The MIT Press Journals, March 2, 2018. Tech Platforms and the Knowledge Problem by Frank Pasquale in American Affairs Journal, 2018. AI winter is well on its way by Filip Piekniewski on Piekniewski's blog. Power Causes Brain Damage by Jerry Useem in The Atlantic, July-August, 2017. How to eat: bread, rice. Do digitised land records mirror reality? by Sudha Narayanan, Gausia Shaikh, Diya Uday and Bhargavi Zaveri. The World Bank's EoDB rankings estimate that it takes 53 days to register a property transaction and update the revenue records in Mumbai, and that the costs of such registration and updation aggregate to 7.6% of the property value. The corresponding numbers in OECD countries are 22.3 days and 4.2% of the property value. These rankings evaluate India's land administration systems on several parameters, such as the quality of the infrastructure for maintaining land records, the transparency of information and the dispute resolution mechanism. They rank India in the bottom quartile on these aspects. Weak infrastructure for land record administration undermines property rights (DeSoto (2000)), and has an overall impact on growth (Deininger and Feder (2009)). Building sound infrastructure for maintaining land records assumes great significance in developing countries like India, where land accounts for a significant proportion of a household's asset portfolio. To improve the quality of such infrastructure, the central government rolled out two (2) centrally sponsored schemes across India in the late 1990s. Through wide-scale digitisation, the schemes aimed to achieve more accurate land title records and better service delivery to the citizen. The schemes were merged in 2008 and subsequently renamed as the Digitial India Land Records Modernisation Program or DILRMP. Such state-led interventions to define property rights in land have often been termed simplistic. Equally, they have been criticised for compromising local realities and existing institutional arrangements (Easterly (2008)). At the same time, the benefits of such approaches in allowing better enforcement of property rights and the consequential easier access to credit and capital, have also been widely acknowledged (Deininger and Feder (2009)). The jury is, therefore, out on the impact of a top-down approach towards improving land titling. The biggest risk of a centralised approach towards digitisation is that the digitised records will not reflect reality (Bromley (2009)). In May 2017, we undertook a field study to ascertain the extent to which the DILRMP had been implemented in Maharashtra (link, link). One of the main purposes of the field study was to ascertain the extent to which the digitised records mirrored the ground reality on recording aspects such as parcel size, land use, ownership, possession and encumbrances. In this article, we summarise our findings from the field study on this specific question. We find that for the sample land parcels under study, the records largely accurately reflect the names of the owners as well as the purposes for which the land was being used. However, there are greater disrepancies with respect to the parcel area recorded in the digitised record and the actual boundary area of the parcel. We also find disrepancies with respect to the encumbrances recorded in the digitised records and those purporting to actually exist with respect to a given parcel. Finally, we find low levels of public awareness of the digital means available to obtain or rectify property records. These findings hold insights into the aspects of the land record digitisation initiative that need to be improved for true impact. We selected two sample Tehsils, namely, Mulshi and Palghar, for this leg of the study. These Tehsils are mainly peri-urban locations with relatively high land transaction intensity and some prevalence of land litigation. Given our focus on the DILRMP, the sample tehsils are those where the programme had been implemented, in part, if not in full. While both Mulshi and Palghar fit these criteria broadly, they also differ in significant ways. Mulshi has been the focus of intensive effort by the state government, designated as a model tehsil where twelve (12) villages were selected for pilot implementation of the entire bouquet of interventions relating to digitisation. In contrast, Palghar tehsil represents a somewhat typical tehsil in terms of implementation attention. Within these two tehsils, we first randomly selected five (5) villages from the roster of census villages. Within each village, the goal was to pick ten (10) parcels that were not located in abadi, industrial areas, forest or wastelands. The parcels would be at least 0.3 hectares in size in rural areas, and at least 500 sq m in urban or peri-urban areas. Our goal was to ensure that some of these parcels were transacted in the past two (2) years. In reality, not all the villages we picked had a transaction intensity desirable for the project. We, therefore, selected five (5) villages each in Mulshi and Palghar, which, according to the department, had seen a lot of transactions in the past twelve (12) months. Where we did not get enough parcels per village, we included more villages. Often, parcels of the desired size were not available. Nor was it the case that the owners of all the parcels we picked were willing respondents. This meant that the final selection of parcels for the survey departed from our original stratified random sampling methodology. Given that the purpose of the survey is to garner insights into the implementation of the DILRMP, the sample parcels offer adequate material for the purpose, with the above caveats. For all the parcels in the sample, we recorded information about the parcel from the revenue records (i.e. 7/12 extracts) on the following five aspects: (1) ownership; (2) possession; (3) encumbrances; (4) area; and (5) land use. We then went to the parcel to corroborate the information so recorded. Four of these five parameters were verified on the ground via personal interviews through a structured questionnaire and local inquiries. The verification of the fifth parameter, namely area, was done by measuring the parcel using e-Trex GPS devices as well as ETS by trained staff. The e-Trex involves a perimeter walk around the parcel, the ETS uses laser technology to mark corners of the polygon representing the parcel. For those parcels which had been transacted in the last five (5) years, we also surveyed the respondents about their experience with interfacing with the department and their own perceptions of the current system and how citizen experience can be improved. We supplemented individual respondent surveys with focused group discussions (FGDs) in the premises of the sub-registrars in both Mulshi and Palghar. What did our sample look like? Residents : Residents of both Mulshi and Palghar Talukas were interviewed to gain a practical understanding of how processes work in the relevant Taluka, inefficiencies in these processes and the effect of digitisation, in their interaction with various sections of the revenue and land administration. Revenue Officers : Revenue officers were interviewed to understand the status, good practices and deficiencies in the system, before and after digitisation initiatives. Other Stakeholders : In addition to the above cohorts, we also interviewed lawyers, brokers and agents, and land surveyors. While lawyers were asked specific questions with respect to the effect of digitisation on legal processes associated with land transactions, the questions to brokers and agents focused on the efficiency of land transaction processes, before and after digitisation. The questions to surveyors focused on the efficiency, accuracy and hardships involved in measurement, re-survey and drawing up of maps. Table 1 summarises our findings on the extent of corroboration between land records and ground reality. The first row indicates the total number of land parcels studied. The subsequent rows indicate the number of parcels for which the land records reflected the ground reality. Table 1 shows that with respect to ownership, we saw a high degree of concordance between the information on the land records and the on-ground reality. In all except one case, we were able to identify an owner who was mentioned in the revenue records, and in 92% of the cases, we interviewed the owner. As with ownership, for the sample parcels, the land records, by and large, accurately reflected the actual possession. In general, with respect to shared ownership, except for parcels which have been sub-divided by an order of a revenue authority, possession of specific areas is not reflected in the revenue records. We did not find the same level of concordance as regards encumbrances. The encumbrances reflected in the land records did not match the parcel holder's response of the encumbrance on the land parcel. The revenue records only reflect encumbrances associated with loans. We also saw a general reluctance to share financial information (28% of the respondents did not respond to encumbrance related questions, 1% of them explicitly stated they did not want to share this information, and around 8% did not seem aware of any encumbrance). Overall, 95% of the land conformed to the land classification and use as reflected in the revenue records. Only six parcels did not so conform - three were designated as agricultural land in the revenue records, but were either non-agricultural or mixed use in reality and three others were deemed non-agricultural in the revenue records but were being cultivated in reality. We found significant discrepancies in the area recorded in the 7/12 and our measurement of the actual land parcel. Although the ETS is deemed to have greater accuracy than the hand-held GPS device, for both measures, about half of all the sample parcels showed a deviation of more than 20% of the area mentioned in the revenue records. Table 2 summarises our findings on the extent of concordance between the parcel area recorded in the revenue records and the actual area. As with Table 1, the first row indicates the total number of parcels surveyed and the subsequent rows indicate the percentage of deviation from the area recorded in the revenue records. Our report shows that the digitised records do not mirror reality with respect to recording encumbrances and area of land parcels. There are several reasons for this. For instance, we find that while banks and other credit institutions diligently inform the revenue records office of the creation of an encumbrance, the details of satisfaction are not communicated as regularly. Also, the revenue records reflect the loan amount for which the land parcel is encumbered. The repayment of installments of the loan are not communicated to the land records offices, which is one of the reasons for the discrepancy between the details of encumbrances recorded in the land revenue records and in reality. A natural answer to the above problem is providing incentives to creditors to update details of encumbrances in the revenue records. Borrowers generally do not update the details of the encumbrances on their land owing to a variety of reasons such as the difficulty of accessing the land records offices. This problem can be resolved more easily by incentivising borrowers to update the details of their encumbrances to the revenue records offices. For example, the ability to intimate the satisfaction of a loan electronically, may deliver quicker outcomes on this front. The area-related discrepancies are driven predominantly by the lack of awareness of the parcel owners of the true extent of the parcel. There were several cases where the white stone markers, typically installed on the ground to demarcate boundaries, were missing. In other cases, where the parcel was a part of a larger parcel earlier, the owner mentally treated the larger parcel as the relevant one. Demarcation was not done in most cases - with multiple owners, those who were cultivators used mutual understanding of the area to cultivate their piece of the larger parcel. The same understanding seemed to prevail between neighbours in most cases. Most did not feel the need to measure and demarcate the plot. Unless there was an impending sale, it seemed that demarcation and subdivision was routinely avoided. In essence, this issue emerges as a deep concern. Several people also brought up the issue of measurement. In Mulshi, where resurveying and measurement often led to conflicts because the measure did not match the records, they resolved it informally amongst themselves. Currently, while the settlement and survey office is in the process of conducting re-surveys in parts of Maharashtra, the re-survey exercise is time consuming and difficult, owing to a variety of factors such as constraints on the survey equipment and personnel, and disputed land. This requires scalable solutions involving regular surveys and re-surveys of land. The government should consider technological as well as outsourcing solutions, such as those adopted for surveying land in parts of Africa, for their suitability and adaptability in Maharashtra. The household level field survey described in this article serves as a template for a larger audit system for assessing the effectiveness of programs such as the DILRMP. The outcomes of the survey would be richer if it also entailed questions pertaining to citizens' experiences with digitised registries and also examined questions of access. As with all good audit exercises, the findings can act as a feedback loop for the administration in the design or implementation such initiatives. The quantitative and qualitative findings generated by such surveys will go a long way in pre-empting future errors and discontent that is often associated with such top-down initiatives. De Soto, H., 2000. The Mystery of Capital. Basic Books, New York. Klaus Deininger and Gerhson Feder (2009). 'Land Registration, Governance, and Development: Evidence and Implications for Policy'. 24 The World Bank Research Observer, vol. 24 (2), 233-266. Easterly, W 2008. Institutions: Top Down or Bottom Up? American Economic Review, Papera and Proceedings 98(2):95(9). Danier Bromley. Formalising property relations in the developing world: The wrong prescription for the wrong malady, Land Use Policy 26 (2008) 20-27. Sudha Narayanan is faculty at IGIDR. Gausia Shaikh, Diya Uday and Bhargavi Zaveri are researchers at IGIDR.